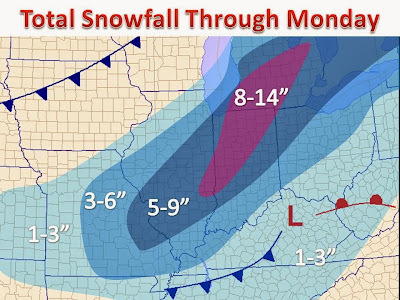 Here is our latest winter storm map for tonight into Sunday. A band of snow will set up from St. Louis to Chicago and slowly push east in time. The band of snow will develop along an Arctic front poised to push in Sunday (see last post for full analysis on the cold). Some areas in Indiana and Michigan will see around a foot of new snow. Lake enhancement is also possible on the SE shore of Lake Michigan where an isolated amount of a foot and a half is not out of the question! After the storm moves through the stage will be set for the coldest air mass in decades!